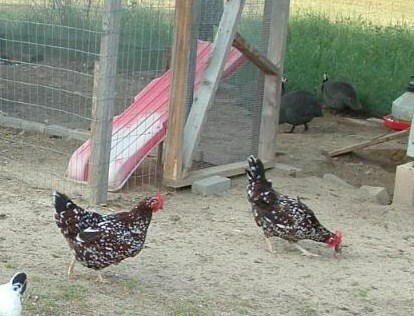 I have two Speckled Sussex hens that are almost 3 years old. They are always hanging around together just cackling away. We have had them since they were about 3 days old. Which is a really long time for us, what with all the coyotes and wild dogs around here. They remind me of a couple old spinsters who never got married! The one pictured above is Camaro. My oldest, who was 10 at the time, named most of our chickens. So there are a lot named after cars and other strange things, lol! The one above is called Red Comb, because when she was small she had a bigger red comb than some of our roosters. If you look at the picture below, taken last year, and then at a recent picture of Red Comb, you'll see a big difference. Here's an old pic and a new pic side by side. When Red Comb molted this year, her feathers grew back mostly white. It's like she's getting old, poor thing! I hope her sister doesn't make fun of her for turning white. She's still beautiful, maybe even more so, and one of our favorites! Oh Nancy, it's sad but true. Getting old happens to the best of us. Even chicks:) They're pretty. My crazy pair Whitey and Ruthie are Speckled Sussex too- they are VERY entertaining. Oh my goodness you had no idea but you brought back a lot of happy child hood memories of me and my Granny and her chickens ! Blessings to you and yours through out the rest of December . 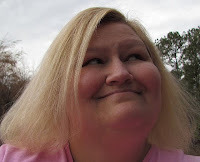 I am so glad I came back home so I could blog for a little bit . I have missed you and your wonderful posts . Still taking care of parents as I can get a leave from work . Take care Sweet friend !